By offering these to others, I aim to share with people of all ages and abilities my joy in being a swimmer, to guide and inspire people to pursue and achieve their swimming goals, with comfort, ease and grace. I don’t remember a time when I didn’t swim. One of my earliest photos is of winning an under-10s event in the club’s annual gala. I spent my teens training on weekdays, sometimes in four different pools in a day, and competing at the weekend, representing Norwich Penguins and Norfolk. After a short break in my early twenties I rediscovered the joy of moving through water, and swam regularly again, training either alone or with Masters’ groups. I quickly learned that swimming didn’t only make me feel great physically, but that it was my most reliable route to mental and emotional health. I took up triathlon, and while I relished the new challenges of running and cycling, it was always in the water that I felt at home. Then disaster struck. Multiple overuse injuries meant that I had to give up swimming, running, and cycling. The pain in my shoulder stopped me swimming for a couple of years, until my doctor advised me to swim again for the sake of my mental health. I managed the pain by limiting the frequency and length of my swims, along with occasional benefits from physiotherapy and steroid injections. It was only a few months after surgery, when I had to abandon a swim after a single length, that I realised I had to try something radically different. My Total Immersion journey began with a weekend workshop in 2009. I quickly learned that the new movements would allow me to swim again. 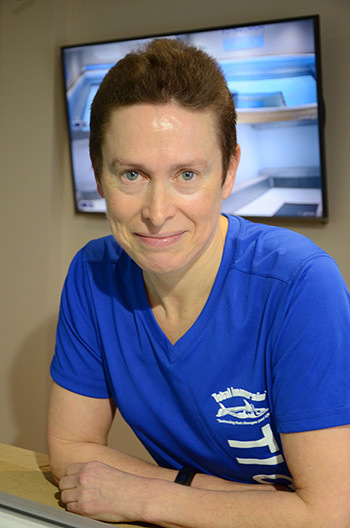 It wasn’t easy – 30 years’ muscle memory of the old way were difficult to overcome – but with the support of Master Coach Tracey Baumann in one-to-one lessons I found I could change the way my body moves in water. Key to the physical changes was the realisation that I had to think very differently about how I spend my time in the water. What began as a search for a relatively quick fix has become a lifetime journey. 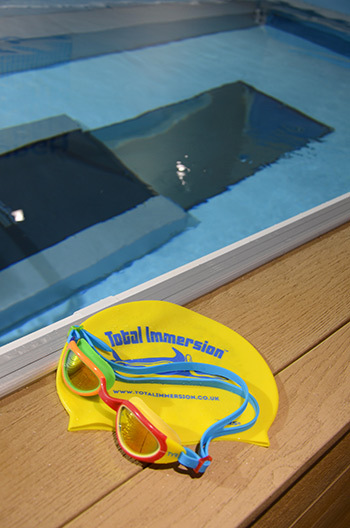 Since I started to ‘get’ the Total Immersion technique, my shoulder no longer stops me swimming, although I still can have difficulty holding an umbrella or a mobile phone for more than a few minutes. With Tracey’s guidance, I have learned to call myself a swimmer again, and do not define myself by my physical limitations. As a teacher and trainer since 1990, I have learned that my skills lie in supporting others to achieve their goals. I began as a teacher of English language, which gave me opportunities to work overseas for 16 years: Egypt, Ukraine, Portugal, Pakistan, India, Nepal, and Russia. Since then I have continued teaching, training and facilitating across a wide range of areas, including workplace communication skills, (presentation skills, negotiating, writing), teacher training, performance management, leadership and management development and organisational change. In several roles in education management, I was responsible for supporting change management and process improvement. When I settled in Edinburgh I transferred my training and improvement skills to healthcare. In 2014 I completed the Institute for Healthcare Improvement’s Improvement Advisor programme, which provided me with the concepts and tools to take a more systematic approach to improvement. Through supporting people working to achieve a wide range of change goals, from improving the morning school run to providing better quality of care across health and social care services in Scotland, I know that the improvement science methods I use can be applied to improve anything. Our Endless Pool has a swim current that is adjustable from zero to race pace, so you swim at a pace that is right for you. The pool is 14 feet long, 8 feet wide and 4 feet deep. When you are not swimming you can touch the floor anywhere in the pool, or take a break on the in-pool benches. Your coach is never more than an arm’s length away. Seating beside the pool is available for parents bringing children for lessons. Accessible shower and changing facilities include towels, shampoo and swimsuit dryer.